Bullion Coins are ones that are only worth their intrinsic gold or silver value only and have absolutely no premium over and above that for any kind of numismatic collectible re-sale value. These are typically U.S. Silver and Gold Eagles, Canadian Maples Leaf coins, old U.S. pre 1965 90% common silver coinage, and many many other coins also fit in this category. In the state of Florida where we are located, there is no sales tax on bullion coins, so these kind of coins are of particular interest to buyers looking make an investment in gold and silver as commodities in speculation of an appreciation of value. 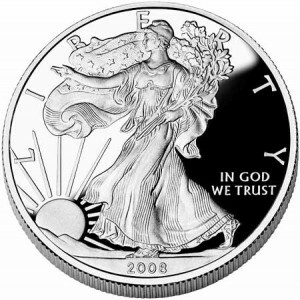 The U.S. government also allows U.S. Eagle Coins to qualify as assets in your IRA. Which means you won't have to pay income tax on them if you make a profit on them when you draw the coins out of your account when you retire. At Belleair Coins, Gold and Diamond we can handle the sale amount of any size investment that you are looking to do. If we don't have the coins in stock we can order them in for you, and believe me we work on a razor thin margin typically only 2-5% depending upon the coins you want and quantity that you are purchasing. We also buy bullion coins, and again we can handle whatever amount you have to sell. If we don't have enough cash on hand, we will call one of our bigger player strategic partners and have them help us broker the deal with you. It's best to sell to a local real shop, if you mail in a huge amount of bullion coins in the mail to a dealer it can be problematic as in the package gets lost or the dealer won't honor their quotes, and so forth. We are a real tangible local business in Tampa Bay, open since 1972 and are willing, eager and expert in assisting you with all of your bullion transactions. No need to buy from the ads you see on TV with William Devane. Save the shipping cost and additional mark up they are charging for all their advertising and buy local from your trusted coin dealer of 40 plus years who will treat you right on the price and who you know will deliver you what you want and where you will have more recourse if not fully satisfied. Note: We are not investment advisors of any kind. We are simply a store where customers who seek to purchase bullion related items can make a physical tangible purchase on our premises. We give no advice to people on how to invest or what the prices of gold and silver may do in the future.